When you are not on the road, it is important to protect your investment from the elements. RV garage plans are ideal for your home on wheels whether it’s an RV, camper or motor home. Check out these popular RV garage plans. 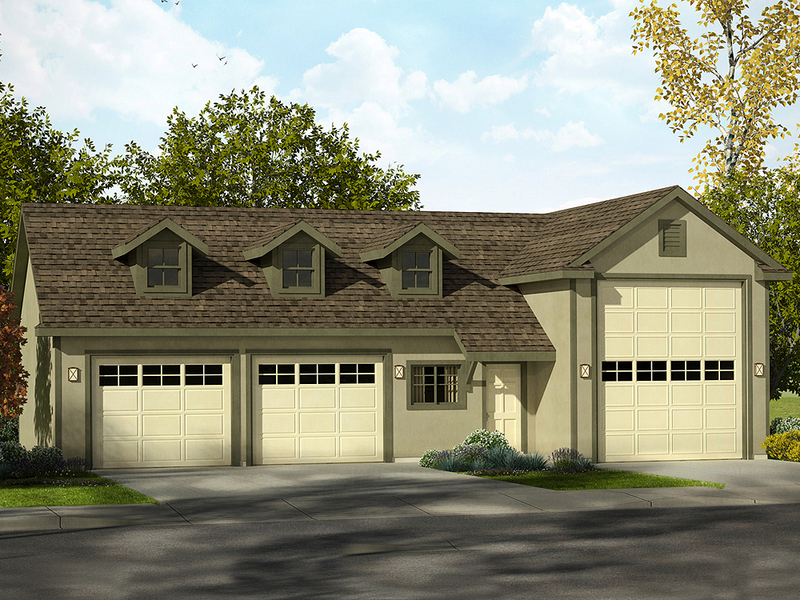 024G-0014: With its classy exterior, this RV garage plan will complement any landscape. One side presents a 16’ ceiling for storing an RV (or boat). The other bay is large enough to accommodate four automobiles. 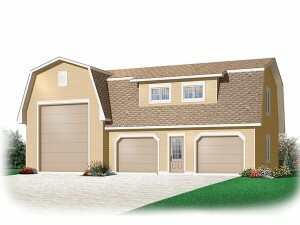 With this kind of open space available, the home handy person will be able to fill it (or use it) in a myriad of ways. 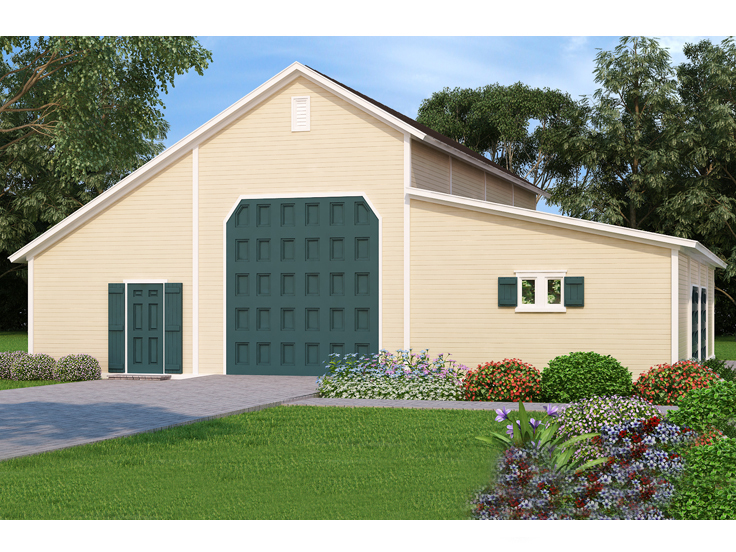 010G-0026: Not only is this a handsome building perfect to house your RV, it offers a handy workshop too. There is a skylight on the garage side to admit natural light. That should help when trying to park that bad boy. Lose yourself in the roomy workshop with its wrap-around bench plus a sink for cleaning up. When it’s time to daydream about your next project (or adventure) take a look through a large window that looks out onto a nifty porch. 021B-0002: How handy can you get with a plan that allows one to drive their recreational vehicle straight through? Well, pretty handy. Take a look at the side bays that offer additional functional space. One side accommodates equipment storage for your carts, four wheelers, jet skis, bicycles, paddle boards and lawn mower. The other side includes a shop area for your tinkering needs, a storage room to organize parts and clutter, plus a sink to wash up after you finish a project. 051G-0086: Here’s a great plan for storing an RV and two cars. The RV bay has a vaulted ceiling that is 14’ tall. Double bays on the auto side also include a storage area between them and the RV bay for all those extras. A handy service entry offers convenience. 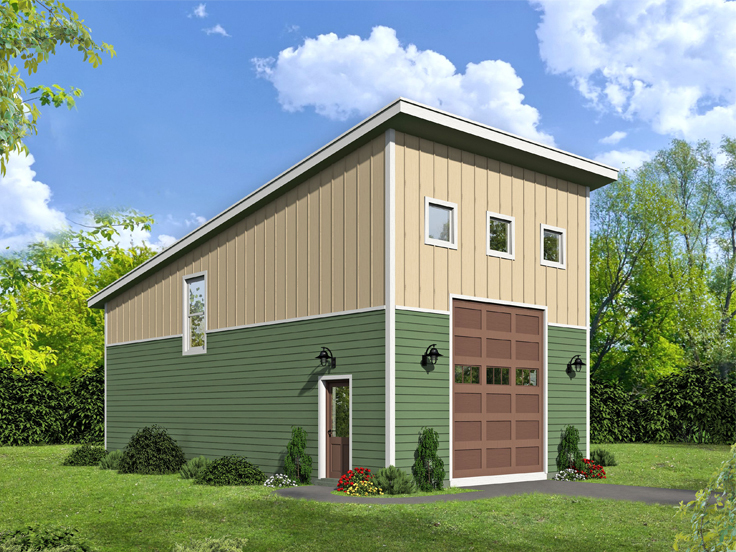 062G-0120: This modern RV garage plan offers “space age” spaces. Check it out! The 20’ X 20’ bay has a two-story ceiling making it “lift friendly.” Behind that bay, find a storage area of equal square footage for stashing away tools and parts. Ascend the interior stairs to a spacious loft. What a great space to create your own studio, hobby room, or gym. Browse our full collection of RV garage plans for more ideas. RV garage plans, sometimes referred to as motor home or motor coach garage, are designed to provide shelter and storage for an RV, camper or motor home when it isn’t on the road. 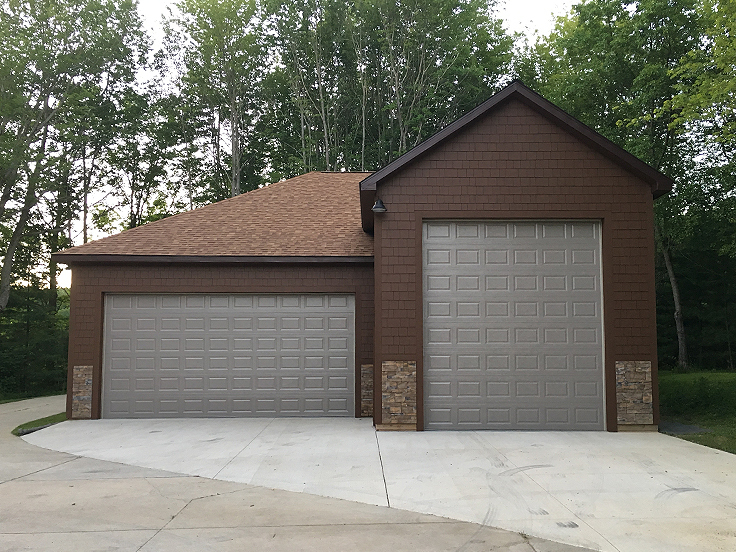 An RV garage has a few distinguishing characteristics when compared to a standard garage plan. RV garages feature at least one bay with an extra tall overhead door, a ceiling that is taller than average, an elevated roofline and an extra deep bay accommodating the height and length of the motor home. RV garages can consist of one single, stand-alone bay or the RV bay might be attached to another usable space such as a two-car garage, ideal for the everyday family vehicles, or a workshop making them even more practical and useful. Many RV garage floor plans include special features such as a half bath, loft, drive-thru bay or workbench. 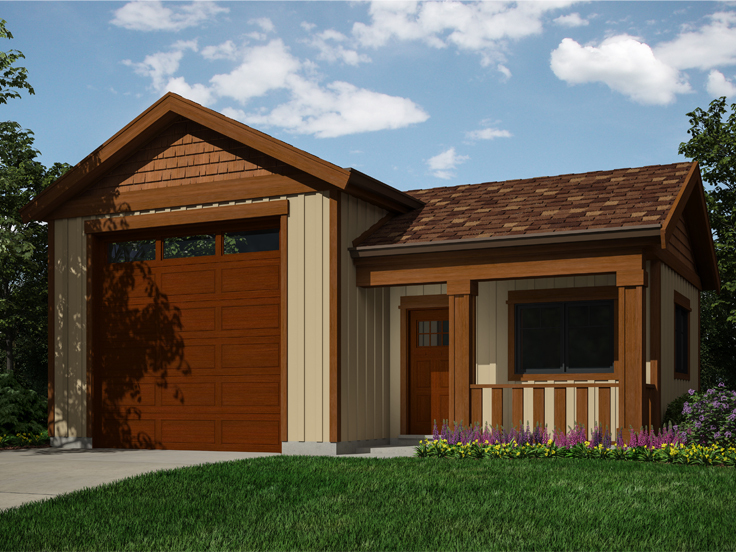 From a single RV bay to a 2-car or 3-car garage with attached RV stall, garage plans with RV storage are available in a wide range of sizes and styles making it easy to find the right one to fit your lot and complement your home. Sometimes RV garage plans are not used for RV storage at all. While they are generally designed for storing a recreational vehicle, the RV bay is also well suited for auto mechanics who’d like to install an auto lift for car maintenance. Also, RV garage plans make a great alternative for a boat storage garage especially when it come to storing and protecting larger boats. Practical and functional, RV garage designs often fit neatly in the side yard or backyard and are sure to keep your home away from home safe when you aren’t traveling. Take some time to browse our collection of RV garage plans to find the right one to suit your needs.